Half a ton of straining flesh driven by a brain the size of a walnut. We love ’em. There is a persistent belief that the Sport of Kings is only open to those with very deep pockets. Oil sheiks. Bankers. Mafioso. Captains of Industry. And, er … Kings. Well nowadays that’s simply not true. 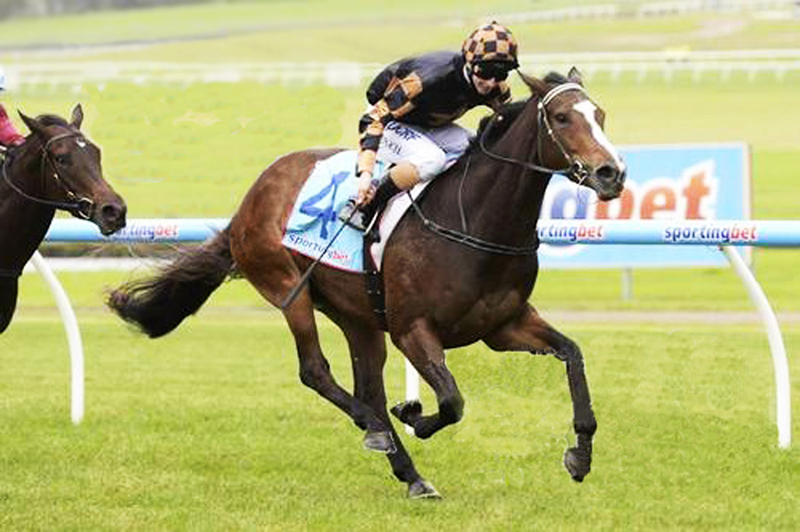 Khutulun belts home at Sandown. Photo courtesy of Sarah Ebbett at Victory Media. With the growth of syndication – where ownership of a horse is split up between a bunch of like-minded owners – the tinker, the tailor, the soldier and the sailor is getting into it more and more. Not to mention, ahem, the occasional writer. Wise advice. So about 18 months back, La Famille Wellthisiswhatithink invested in just 5% of a pretty filly called Khutulun. Our five per cent cost us just a thousand bucks, plus a promise to pay about another $1000 a year. That’s it. Virtually all the horse’s costs would be covered by that investment for a whole year. And we could bale out if money suddenly became an issue. And although a couple of grand isn’t nothing, well, it’s also not a lot to turn a lifelong dream of owning a “nag” into a reality. Not when a top restaurant can be $2-300 a couple for dinner nowadays. We’d rather have sausages at home and feed the horse. Khutulun. Well, she wasn’t called anything at that point, actually, she was just a big, ornery filly with a large arse and a bad attitude. Both things endeared her to us. The large arse because coupled with a big set of lungs they make up the best combination any racehorse can have. Of course, we were guessing on her lungs, but there were “stayers” all down the Dam side of her pedigree, so we hoped we’d picked well. And we loved her ornery attitude, which everyone associated with her was quick to mention. Some people worry about such things, but horses take time to mature, and with a filly, especially – who will race in fillies races and mare’s races, to be sure, but will also have to take on the bigger, stronger even ornier boys sometimes – a little bit of “attitood” never goes amiss. She had plenty of vim and vigour about her – plenty of “you know who I am? – so we took a plunge. She was born at the wrong time of the year to do much in Springtime, so her first “preparation” was in autumn last year. Everyone was full of doubts. She didn’t like her work, loved lying down, was a bit flighty, and didn’t seem to learn. One thing was noticeable, though. She ate everything offered to her like a trencherman on steroids, (she still does), and she never seemed puffed after a run. Some wanted to bail out of her. We hung in, convinced we had chosen well, even when those who are paid to know these things had their doubts. A warrior nature. That made sense. Why Khutulun? The world’s most mis-pronounced name for a horse – think “Kutlin”, Kutulin” “Kootoolin” – it’s actually Koo-Too-Lun, if anyone cares – was a desperate final attempt to find something, anything, that combined it’s Sire’s name (Soldier’s Tale) with it’s Dam (Great Tradition). Perhaps fifty names were knocked back as already in use. Eventually Khutulun – a warrior princess from Mongolia, daughter of Kublai Khan, famous horsewoman – got up. Cue press releases hopelessly trying to persuade race callers to pronounce her name correctly. The owners didn’t care: it was just one more “us against the world” feature of the whole exercise. We knew how to say her name, that’s all that mattered. And as soon as Miss Ornery of Caulfield hit a racetrack – in cheerful, charming, rural Kyneton – she proceeded to cause a shock. Because she romped home to win it. All over the park, a little bit to the left, then heading right, belting on down the straight when the race was already well won, apprentice jockey clinging to her back for all he was worth. And she pulled up looking ready to go round again. Cue raised eyebrows all round. A series of races at Sandown and Caulfield city tracks followed. For many racehorse owners, just getting to a city track is as good as having a winner. That wasn’t what Khutulun was about, though. She never ran worse than fourth, grabbed a third, a fighting second to the horse that later won the Queensland Derby, (after having been baulked 200 metres out, too), and bagged another win. She quickly amassed $100,000 in prize money, and she still didn’t run like a racehorse. She just shook her head up and down and side to side and ran. And ran and ran and ran. Clearly didn’t like the idea of any other horse getting to the line in front of her – ornery, see? Her season ended with a creditable performance beaten maybe three lengths in the Queensland Oaks when she started from the widest possible barrier and threw a shoe off halfway round. She was cheered on by a bunch of owners who had flown in from all round the country. A horse that cost us just $1,000 each, running in a Group One race in the sunshine in Brisbane. A horse no one thought would ever do anything, from a Sire that was recently retired because nothing ever won from it. Dream come true? You betcha. And along the way, something rather lovely happened: the 20 owners became friends, and turning up at the races became like one big party each time. A more disparate bunch you couldn’t imagine – a Council worker, handful of tradies, a writer, couple of public servants, a pair of real estate experts. More than a few tubes of amber throat-charmer lubricated the delightful swapping of life stories, everyone enthusing ever more delightedly about “our girl”. Luke Oliver … quietly spoken, a shy, ready smile, and a headful of bloody clever. We got to know the trainer, Luke Oliver, and his racing manager Steve Leonie. A nicer pair of blokes you could not imagine. Not only were they and their team turning our no-hoper into something resembling a champion, but they never showed a moment’s ennui while answering our endless (and usually ignorant) questions without giggling at us even once. Luke’s the quiet pragmatic type. Steve Leonie cares so much about each of the horses they train he frequently can’t stand to watch the actual race, heading for a quiet spot in the cafe for a fortifying coffee. Or to the bar for a fortifying something stronger. They both have passion in bucketloads. Steve kindly arranges lessons in racecourse ettiquette. Because that’s the other great joy of being an owner, of course. On arrival at the track there’s free parking and the man at the gate in the blazer who waves you through with a cheery “Good luck, Sir … Madam.” Then they immediately usher you into your own private area for a free drink, or at the posh courses, a free lunch. Well, not so much free. You have to buy a horse to get in. But you see what we mean.You don’t have to be royalty, you just feel like it. And wonder of all wonders, you get entry to the mounting yard before and after the race, where you stand around frowning intelligently as the trainer first tells the jockey what he wants him to do, using all sorts of riding jargon that means the best part of bugger all to those of us standing around nodding for all we’re worth, but that’s OK because what we’re really doing is impressing the pants off our friends who are left back in the stands, because this is the the most “we made it” moment of all moments imaginable. And ten minutes later we’re there again, smiling and taking photos with the jockey and a sweaty successful horse, trying to shake the jockey’s hand only to be told – again with exquisite politeness – that this is, of course, against the rules, and whooping and a-hollering, and generally behaving like six year olds on an extra dose of Ritalin. And all around us stand solemn rich people whose hugely expensive horseflesh we have just made to look like it was rooted to the spot, all mildly discomforted by the council workers and tradies and public servants and retail experts and writers who miraculously now find themselves calculating their share of another winners cheque. And sod them, too, suffer in yer jocks, buddy, because we’re The Khutulun Crew, and that’s all ya need to know. And then there was the team from the syndicator, Grand Syndicates, Sam Lyons and Peter and Karen Morley. An email or voicemail every week kept us up to speed with every gulp, fart, hiccup and snort the horse gave out, helping us all to feel genuinely part of the loop, even tangentially involved in the training decisions and where to race her. When we got to Queensland the Grand Syndicates crew even threw a few bob over the bar and we all drank free for the afternoon. And some of us drank a little too much. Ah well, what happens in Vegas, etc. They didn’t have to do that. Nicely done, right there. And once again, they were always endlessly patient with the inevitable barrage of questions from the over-excited owners. And so now we’re here in October 2014. Now the blossom is on the trees, and the wind has switched from the West to the North, the grey skies have flown away and it’s all “on again, for man and boy”, as they say over here in Oz. And for daughters, and wives, and friends. After winter standing around eating her paddock down to bare earth, Khutulun’s “preparation” number two is underway, Spring is here in all it’s glory and The Khut (we’re in Australia, of course she has to have a nickname) is back in the lists. So in the watery Spring sunshine, Khutulun goes to Sandown last Saturday, just for a little jump out, you understand? Looking like a right trollop, with half her winter coat still on her. Fair enough, then, we’ll have a quiet beer or three and just enjoy the sunshine. Bang. A winner. Again. Ornery. Always put your money on ornery. I hope Grand Faith is as good: good luck to you all. Fabuloue story; well written and a joy to read! That was a beautiful read, Yolly. I was “in the stands” at Sandown for her win there, and I could feel the excitement of you blokes. And may have had a few bob on her myself that day, so was lifting my hat to you all. Here’s looking forward to the rest of her long career. Great story. Me being a first time owner I hope I have the same feeling when my horse goes to the races and get my photo taken in the winners circle. Looking forward to this. Good on you, Lee – very best of luck. What’s the name of your horse? I shall keep an eye open!